We opened our doors on Fountain Square in Downtown Cincinnati on October 11, 2007 by one of the most prominent and successful restaurateurs in Cincinnati. Chef Cristian and Amanda Pietoso became the sole owner/operators of the restaurant in 2012. Since the restaurant’s inception, Chef Cristian has brought true, authentic Italian cuisine to Cincinnati. He started at Nicola’s adapting authentic seasonal Italian fine dining and now brings the same experience to Via Vite along with handcrafted recipes made from the finest imported and local ingredients. Born and raised in Florence, Italy, Chef Cristian Pietoso has worked in some of the most renowned restaurants in Italy; among those, Cibreo (Florence, IT) under Chef Fabio Picchi, Pane e Vino, Belcore and Dulcamara under Chef Pierluigi Campi. Chef Cristian is a graduate of the Culinary Institute of Florence, Bernardo Buontalenti. In 2000, Chef Cristian moved to London to work as Pastry Chef in the world-renowned Savoy Hotel right in the heart of the city working under Chef Anton Edelmann. 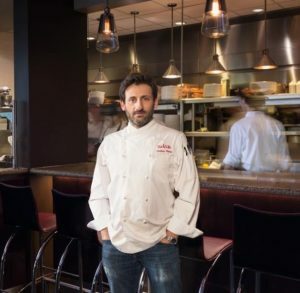 In 2004, Chef Cristian moved to Cincinnati to join his father at Nicola’s Restaurant where he worked as Executive Chef until he opened Via Vite on Fountain Square in the Central Business District of Downtown Cincinnati, Ohio. Since then Via Vite has experienced phenomenal growth and includes expansions such as its Piazza Bar. The all-new, open-air outdoor Piazza Bar is a stunning addition overlooking the Spring and Summer activities on Fountain Square. Fulfill your craving for old world Italian service and authentic cuisine while taking in the breathtaking views of downtown Cincinnati!